When there’s something strange in your environmental scientist commune, who you gonna call? Today BBC Studios revealed that 1973's Season 10—home of Doctor Who’s groundbreaking 10th anniversary celebration “The Three Doctors,” uniting Jon Pertwee, William Hartnell, and Patrick Troughton’s Doctors for the very first time—is the latest classic season to be released as part of Doctor Who: The Collection, joining the likes of Tom Baker’s first and last seasons on the show as well as Peter Davison’s debut. 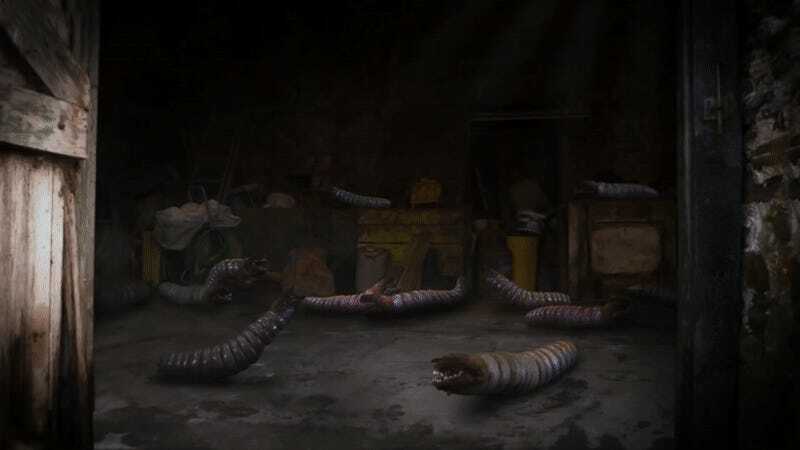 “The Green Death” was Manning’s final story as Jo, and saw her and the Doctor battle oversized creepy-crawlies in South Wales, after toxic sludge mutated them to monstrous size. Over the course of the story Jo met eco-activist Cliff, and fell in love—hastily announcing not just an engagement, but that she and the Doctor would be parting ways, leading to the heartbreaking moment the Doctor quietly exits Jo and Cliff’s engagement party and drives off into the sunset. Doctor Who: The Collection—Season 10 is set to release in the UK July 8; it’ll hit the U.S. as the awkwardly titled Doctor Who: Jon Pertwee—The Complete Season Four October 15.